Lavender oil is steam-distilled from the flowers of the lavender plant. The unique mosaic of naturally occurring phytochemicals includes linalool and linalyl acetate, considered to be its main active constituents. Linalool exerts a relaxing effect on smooth muscles by inhibiting release of the compound acetylcholine, a neurotransmitter that acts within the neuromuscular junction. Simply put, acetylcholine triggers nerves to stimulate muscles; modulation of this compound promotes relaxation. Lavender oil has also been shown to support activity of gamma-aminobutyric acid (GABA), the amino acid that regulates and relaxes brain activity. Lavender oil has been granted government approval in Germany for therapeutic use in cases of anxiety and depression. Clinical trials have also indicated lavender oil to help reduce symptoms of general anxiety disorder (GAD), posttraumatic stress disorder, and chronic fatigue syndrome. Controlled clinical trials additionally show comparable results to the common group of prescription drugs known as benzodiazepines, without their side effects. 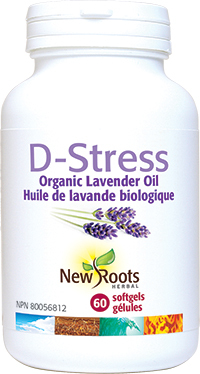 New Roots Herbal’s D‑Stress softgels deliver relaxing effects for both body and mind. They can definitely be a side effect–free and nonaddictive therapeutic choice for coping with many stress- and anxiety-related health concerns. Adults: Take 1 softgel daily with food and a full glass of water or as directed by your health-care practitioner. Other ingredients: Organic olive oil and natural vitamin E from sunflower (ᴅ‑alpha-tocopherols) in a softgel composed of annatto extract (in sunflower oil), bovine gelatin, glycerin, and purified water.